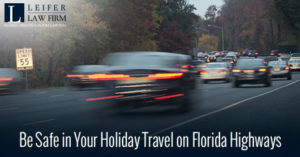 The Florida Department of Highway Safety and Motor Vehicles had its Holiday Travel Campaign get underway recently. The program’s purpose is to keep motorists aware of the dire consequences of not following the rules of the road when driving. Millions of people will be on Florida’s highways during this festive season. Law enforcement agencies are teaming up to make sure that everyone arrives where they are going safely. Throughout this holiday season, there are many ways you can work to be a safe driver while on the Florida highways and byways. Maintain your vehicle – proper tire inflation and engine maintenance is not only good for mileage, but can also help avoid blow outs or engine problems that can cause an accident while you are driving. Buckle up – improper use or not using seat belts at all accounts for about 20% of serious injuries in motel vehicle accidents. Make sure that you and all of your passengers are properly seated, and seat belted in for the duration of your trip. Proper use of your seat belt can save your life in the event of an accident. Secure trailer hitches and make sure everything is properly tied down- If you are towing a trailer or have bags and gifts tied down, make sure to double check all hitches and pins on your trailer hitch. Confirm that your lights and brakes on the trailer are working properly. You should use a recommended cargo net or container if carrying things on your roof. A loose trailer, or free flying bags and boxes are definitely a road hazard. Slow it down – everyone is anxious to arrive at their destination so they can begin enjoying the holiday festivities. Following the speed limit can make sure that everyone on the road makes it to their destinations safely. It is never a good idea to speed, but it becomes even more of a danger in the congested holiday traffic. No drinking or drugs and driving- in 2015 there were over 20,000 crashes on Florida roads. 42% of these were drug or alcohol related. Drugs (even prescription) and alcohol both can cause you to have a lack of good judgment, impair your motor skills, and dull your reaction time. This makes even the best driver a danger to themselves and others. Save your celebrating for after you arrive safely! If you want to go out and celebrate there are many car services that provide rides to partiers during the holidays. Don’t drive distracted – Because of the crowded holiday conditions, it is more important than ever to pay attention to everything around you. Keep your hands on the wheel and eyes on the road. No cell phone, GPS, looking for your favorite station, or car game with the kids is worth loss of life or serious injury. It is most important that you, as the driver, are always aware of your surroundings, and ready to react at a seconds notice. You often have to be prepared for detours, stop and go traffic, weather, or dozens o other things that will require you to make split second decisions. The holidays are a time of joyous celebrations with family and friends, and we want everyone to have a safe journey, wherever you may go!